Because urban trails encourage more people to bike, walk and run, they happen to be one of the best tools we have to improve public health. This desire to help people improve their health is in part what fuels our work to advance a continuous Chicago River Trail. For the past year, we’ve been working closely with one of our partners, public health students at the University of Illinois-Chicago (pictured), to identify the public health benefits the proposed Weber Spur Trail would bring to the Northwest Side. With help from Active Trans supporters (Alderman Laurino, North River Commission and North Branch Trail Alliance), the students surveyed more than 240 residents, finding that nearly all of them expect public health to improve significantly when the trail is completed. This trail will create safe passage between two of the busiest regional trails, the North Branch and North Channel Trails, and it will provide access to Elston Avenue’s bicycle lanes and the Jefferson Park Blue Line Stop (see map). In addition, residents identified five specific ways completing the Weber Spur would benefit the neighborhood. They include: more space to exercise, safer and easier access to parks, cleaner air, less noise and light pollution due to reduced traffic and safer roads with less people driving and more choosing to bike and walk for everyday transportation. These outcomes support research that shows trails are smart public policy in the way they improve public health, strengthen economic development and clean up the environment all at the same time. 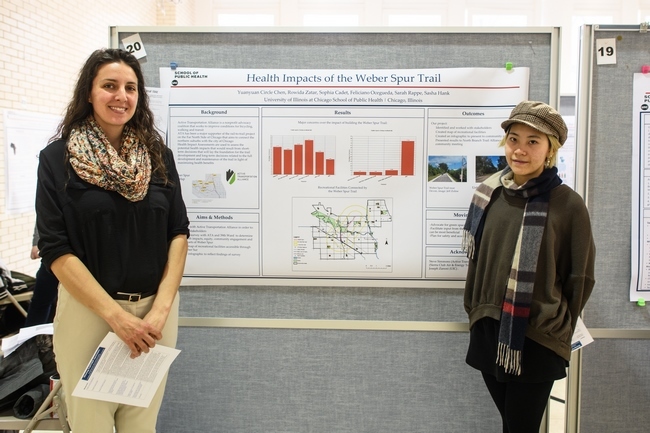 Along with public health benefits, the students analyzed bicycle crash data and found a high number of crashes occur in an area that’ll be served by the Weber Spur Trail’s southern section. This area starts at Irving Park Road and runs north to Ainslie and is bounded by Avers to the east and Central Avenue to the west. Improving safety for bicyclists is another compelling reason for the city to follow through on its plans to build its 1.7-mile portion of the trail. The best way to encourage more biking and walking is to provide safe and easy access to trails and neighborhod greenways. Active Trans’ Chicago River Trail campaign would like to thank the UIC public health students for their research and partnership. Would you like to help us push for the Weber Spur Trail? Click here to join the Chicago River Trail campaign.